At this point in my life, soda is my biggest vice. I crave it more than anything else, including chocolate! Cutting back on the number of Diet Cokes I consume is at the top of my list of 2013 New Year’s resolutions. One thing I’ve often heard of as helpful for people trying to kick the soda habit is to make their own flavor infused water. I’ve tried this in the past and haven’t had much luck. My water either seems to have no flavor at all or I get weird fruit chunks in my water and it looks totally unappetizing. However, I’m very interested in the ZingAnything Citrus Zinger. This unique water bottle has a compartment for your oranges, lemons, or other fruit at the bottom. You put the fruit in the compartment, fill the top with water, shake it up, and enjoy. The ZingAnything Citrus Zinger is made with BPA/EA-free Tritan Plastic from Eastman and is dishwasher safe for easy cleaning. It also has a finger hole at the top for easy carrying. 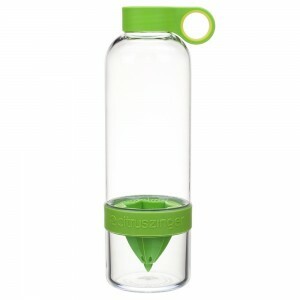 The ZingAnything bottle holds 27 ounces, which I think is great because I personally hate having to get up to refill tiny water bottles all the time. However, I think it would be nice if they had a smaller size available for children to use. I’d love to try to get my son interested in drinking flavored water, but a bottle this big would probably be spilled before he was finished drinking. The ZingAnything Citrus Zinger gets overwhelmingly positive reviews on Amazon, but I’d love to hear what my fellow Smart Moms think. If you’ve tried this product, would you recommend it to others?